One of only a handful of University of Miami athletes who has starred in three sports, football, baseball and track, Jack Losch made his name best known to Hurricane fans by his exploits on the Orange Bowl field. A three year standout as a halfback and defensive back, from 1953 to 1955, Losch accounted for 503 yards in career rushing, a 7.9 yards per carry average and 247 yards receiving, 22.5 yards per catch, while pacing the Hurricanes to a 18-9 record. And, despite the recent success of offensive explosiveness, Losch's records for longest run from scrmmage, 90 yards vs. Bucknell in 1955, and rushing average per carry, 9.06 in 1955, still rank among the tops in Hurricane history. He was UM's top sprinter for three years in track and played catcher for the Canes baseball team. Jack Losch was truly a three sport star. As a boy, Jack Losch was the center fielder on the first Little League Baseball World Championship team in 1947. 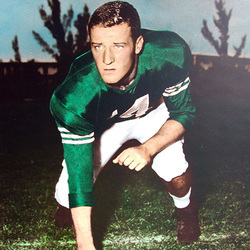 As a young man, he established football rushing marks that continue to be in the record books today at the University of Miami where he was an All-American as a senior in 1955. A year later, he became the first Little League Baseball World Series participant to play a professional sport when he was selected in the first round of the National Football League amateur draft by the Green Bay Packers. In 2004, the Jack Losch Little League Baseball World Series Team Sportsmanship Award was established and is presented to a Series team each year that best exemplifies the spirit that Mr. Losch displayed both on and off the playing field.